A tiny neighborhood on the side of Mount Davidson. Originally appeared in WNP Member Newsletter, Fall 2007. Even the legendary "Merry Man," San Francisco Chronicle columnist Herb Caen, got lost looking for Robinhood Drive on his way to Thanksgiving dinner in Sherwood Forest, hidden on the southwesterly slope of Mount Davidson. The original three-by-two block community of about 200 homes, nestled in the forest planted by Adolph Sutro, is still outlined by the original globe streetlights. An irreverent article about the West of Twin Peaks District neighborhoods described Sherwood Forest as being crowned with "some of the more elaborate ranch-style homes to be found in San Francisco. One has white colonial style columns and a weathervane atop its carriage house. Another has enough rocks in its retaining wall to dam Islais Creek. There is a sort of English manor house. And groves of eucalyptus, cypress and pines in the gardens. Southerly and easterly, the homes are smaller and closer together. Sandwiched between Sherwood Forest and Miraloma Park is Sherwood Heights, an upper middle class neighborhood of postwar-era homes. 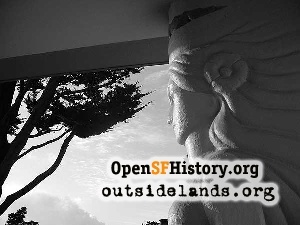 The dense groves of Mount Davidson are just outside most of its doors." Aerial of early homes on Lansdale Avenue in Sherwood Forest in the 1930s., 1930 - Courtesy of Denis Pinto. Secluded Sherwood Forest has some of the city's largest residential lots with panoramic ocean view custom homes dating back to the 1930s. Nicknamed "Pill Hill," due to the many doctors living in the neighborhood, it could also be called Pflueger Hill. Timothy Pflueger, one of the most significant of San Francisco's architects in the 1920s, 30s, and 40s, who designed such landmarks as the Pacific Telephone Building, the Paramount Theater, the Castro and El Rey Theaters, the Union Square Garage (the first of its kind), and the I. Magnin department store, was the architect of two of the earliest houses to be built in Sherwood Forest. Doctors Vollmer and Delprat had offices in the high-rise Art Deco medical and dental building that Timothy Pflueger designed at 450 Sutter Street. They hired him to build their houses on Lansdale Avenue. A few years later, Timothy's brother, Dr. Otto Pflueger, moved into the Mediterranean style home at the corner of Lansdale and Robinhood Drive. Another brother and architect, Milton Pflueger, built his family home further up Robinhood in 1950. Caryatid at the entrance of a Timothy Pflueger-designed home in Sherwood Forest. The house on Lansdale Avenue was built in 1936 and featured at the Golden Gate International Exposition. - Courtesy of Denis Pinto. 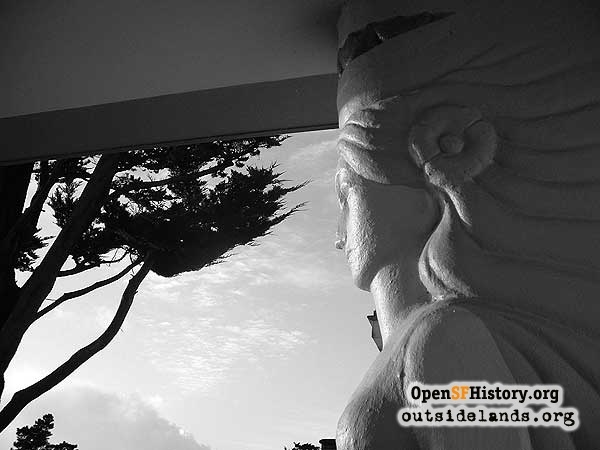 A unique caryatid facing the grand view of the Pacific Ocean anchors the entrance to the five-bedroom, five-bath Streamline Moderne style home that Timothy Pflueger designed for Drs. Delprat. A derivative of Art Deco, the horizontal and rectangular design utilizing concrete, stucco, and aluminum details was featured at the 1939-40 Golden Gate International Exposition as "embodying both a futuristic vision and paean to the past." 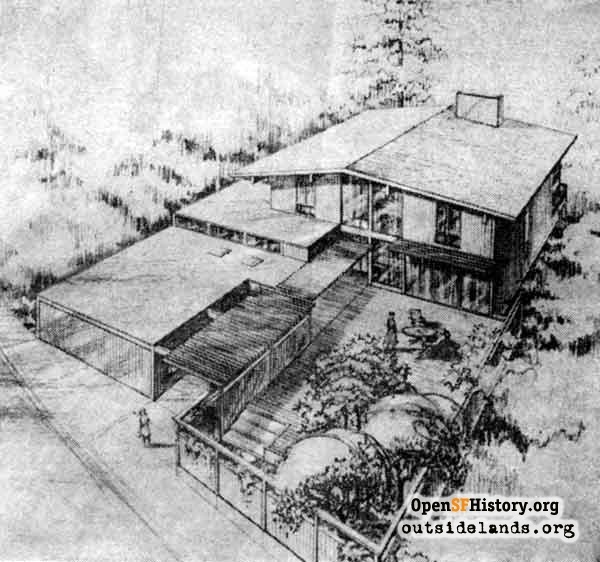 The building permit for this innovative home design was issued before the exposition, on March 20, 1936. The husband and wife doctor duo had no children but filled their large home with their artistic and gardening pursuits, as well as with parties. Dr. Pedro Pinto attended one of those parties as an intern and later purchased the home for his wife and five children at the probate sale in the 1960s. At that time, Dr. Schweifler and his family lived next door in the Mediterranean style home also designed by Timothy Pflueger. 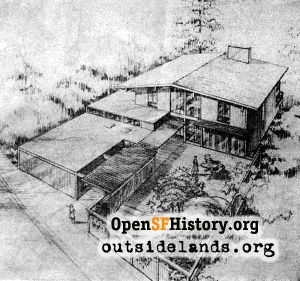 In an article for the San Francisco Examiner in 1954, Milton Pflueger wrote about the "city house with country atmosphere" he built in Sherwood Forest for $45,000. 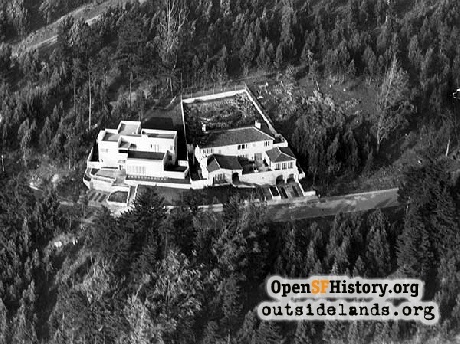 "One of my favorite houses is located in San Francisco, on the southwest slope of Mount Davidson. I have chosen it because I feel it demonstrates that those advantages which are sometimes thought to be available only in our suburban communities can be matched right here in the City. This house, which we designed for our own, is a modest, contemporary home, with an in-line plan conforming to natural slopes... A structural system of exposed roof beams on wood posts, with exposed roof sheathing, employed throughout, contributes to the unity and interest. Roof overhangs are generous. An all redwood exterior with accents of yellow at the projecting roof fascias was used... The sweeping indoor and outdoor views of city, hills and ocean, added to a natural, straightforward design, have combined to provide ever-interesting, practical and thoroughly enjoyable living." Sherwood Forest developers, Baldwin and Howell, not only brought the legendary Robin Hood to life, but also a popular KGO radio family too. To publicize their expansion of the Sherwood Forest neighborhood, Baldwin and Howell built a "Dream House" for the Edwards at 1 Cresta Vista Drive. This fictional family of five (John and Edna Edwards and their children Jack, Sam, and Florida) broadcast weekly radio shows from San Francisco. As they discussed and designed their dream home during their live radio broadcasts, Baldwin and Howell, in conjunction with W&J Sloane, built and furnished the home exactly to the specifications of this radio family. It was built as a four-bedroom, 3-1/2 bath home, with reception hall, step-down living room with patio and front balcony, breakfast quarters, large dining room with its own patio, family room, maid's quarters with separate bath, and a new, "all electric" kitchen designed by General Electric. 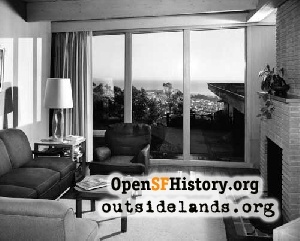 It also boasted unobstructed views of San Francisco and the Pacific Ocean, and had terraced front and rear yards. Den of architect Milton Pflueger in his Lansdale Avenue residence in Sherwood Forest. - Courtesy of John Pflueger. Some of the unique features of this Streamline Moderne home included one of the first electronic security systems ever installed in a San Francisco home, a one-of-a-kind "machine-age" deco stair railing (reminiscent of a classic ocean liner of that era), metal kitchen cabinets built by General Electric, and a buzzer system that notified the maid when services were requested. 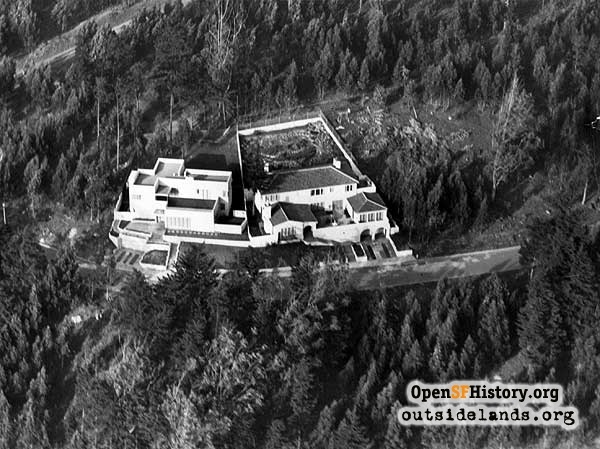 The home was completed in October 1941 and the first open house was conducted on Sunday, October 12. Representatives from General Electric, KGO Radio, its then parent affiliate NBC, and many radio stars of the day---including Helen Morgan, Will Aubrey, and Rod Hendrickson---were present. The Edwards family was there as well, doing the on-the-air radio broadcasts from the house. On that day, several thousand people visited the home. For the rest of that fall, the home was open for tours, and the Edwards family broadcast from the home every Sunday. More than 25,000 people visited the home until Sunday, December 7, the day Pearl Harbor was bombed. The home was then sold. The first owners lived there for 10 years, and then sold to Dr. Hodgson and his family, who lived there for forty years---until August 1992. Sherwood Forest was in the news again in 1964 when Mayor and Mrs. John F. Shelley hired architect Robert Bachelor to design a two-story, 10-room, five-bath, 5,700-square-foot home at the top of the city's highest residential street, in the shadow of the Mt. Davidson cross. Costing more than $110,000, the mayor and his family never lived in the home, which may have become too extravagant for a public servant after longshoreman contractor Alex Maisin built it between 111 and 123 Robinhood Drive. 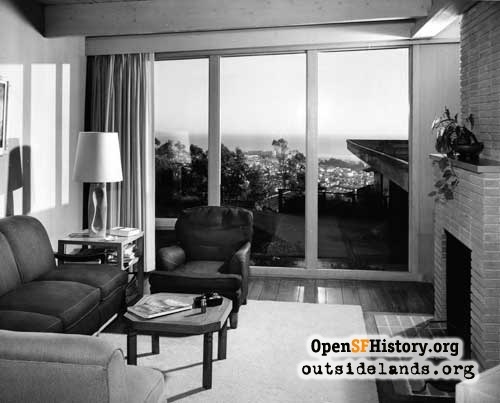 George Moscone, however, did move to a home on Lansdale Avenue before he was elected Mayor of San Francisco in 1976. He then moved downhill to St. Francis Wood, after he was advised (according to neighborhood legend) that a more prestigious address was needed for the city's highest elected official. Public attitudes about appropriate mayoral abode had apparently changed. After Herb Caen got lost, the neighborhood residents started lighting the way with luminaries every year on Christmas Eve. Herb wrote in 1986, "I had a Thanksgiving spread at a friend's house in Sherwood Forest, an area near St. Francis Wood that is unmarked on most maps and not all that easy to find. As is my wont, I got lost several times, learning more about Miraloma Park than I really cared to know. The point, if any, however, is that it's a lovely part of the city, with little windy streets, pretty houses, and a magnificent view of the ocean, even through a mound of turkey bones. There is more to SF than Pacific Heights, by golly, and you don't need a visa. Just a good map."